An anonymous donor inspired by #TheBladress journey has generously committed to matching all donations! Your contribution to this campaign will be matched dollar for dollar up to a limit of $40,000! For a limited time your donation will have double the impact. Please be generous and help us change girls’ lives. One Girl Can (USA) hasn't added a story. My journey is inspired by a desire to empower girls worldwide. All funds raised will be donated to One Girl Can, to provide bright and deserving girls living in poverty in Kenya with secondary school scholarships. Education is crucial to ending the vicious cycle of poverty, child marriage, and gender inequality. More importantly, it provides an opportunity for girls to reach their full potential and pursue a life of their choosing. The project is based on my belief - love is the most magical and wonderful thing that exists. The freedom to pursue a relationship of our choosing, based on love, shared interests and compatibility is something many of us take for granted. Yet there are currently millions of girls who are married before they can even comprehend the concept of romantic love. Some become wives when they are as young as 8 years old to a husband 5 times their age, who often has multiple wives. One of the most common causes of death for girls aged between 15 and 19 in developing nations is pregnancy and child birth. Girls are seen as a reproductive tool, a money tree, and a laborer. Being able to voice their opinions, let alone believing in their untapped potential, is an elusive dream. But education is proven to be the single most powerful method to change the old concept from Girls Can’t to Girls Can. Together, let’s share our love and freedom to love with these girls in Kenya. Together, let’s end child marriage. +$60,000 – will pay for one full year of secondary school tuition for 120 girls! One Girl Can (USA) hasn't posted any updates yet. One Girl Can (USA) is managing the funds for this campaign. 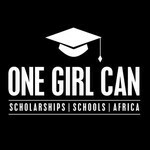 One Girl Can (USA) is a verified organization.